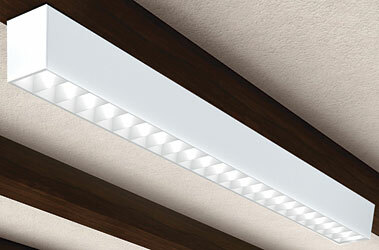 FLUORESCENT LUMINAIRE line includes three narrow aperture linear styles in eight mounting types. Microlyne Rectilinear features a high-efficiency parabolic louver. The 1T5 is 85.5 percent efficient; the Mini has an efficiency rating of 83.5 percent, according to the company. Available as a cable mount, surface mount, wall mount or recessed in 3.5-inch and 2.5-inch apertures.